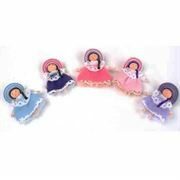 Personitas are a range of ethically produced, fair trade Worry Dolls, Angels and Fairies, made in Colombia by one family. Personitas is run by Pily, who is responsible for the design and development of the range, sourcing fabrics and other materials from Colombian suppliers. The range is produced in two locations: the basic figurines are produced in Popayan, where the wirework structures and bodies are formed, and in El Retiro the products are sewn together and finished. Both locations are small workshops manned by various members of the same family. There's a huge amount of work that goes into each doll- for example the thread for the hats is dyed to match the material before being used! When we purchase the stock, we pay the asking price- we don't use our size to negotiate discounts. This is to ensure that the producers don't have to worry about making a profit. All funds paid for stock go directly to the producers, the family and the local villages. Personitas is a great example of a global product keeping trade local! As their UK distributor we offer wholesale worry dolls and other Personitas products to retailers around the UK. If you're interested in becoming a stockist, please call for further information. Wholesale Worry Dolls: We purchase the Personitas range directly from Colombia and supply retailers across the UK and Europe. If you're interested in stocking the range, please complete the form at the top of the home page to register for a trade account. In Colombia, fairies are mischievous creatures who like nothing better than to play tricks on people. These wishing fairies are produced by one family in Colombia and are a variation on the Worry Doll theme which is so popular. It's said that at bedime, tell your wishes to your Wishing Fairy and place it under your pillow in its bag. While you're asleep, if you've been very good and you're very lucky, sometimes the Wishing Fairy will wake up and grant your wish! Our Wishing Fairies are made by hand in Colombia by one family. We purchase them directly from the manufacturer so the money we spend on them goes directly into the local economy, and the family receive 100% of the profit from the goods. Please note that as these products are handmade, some patterns and designs may vary a little from the image shown. If the exact pattern is important, please let us know when you order, and we'll do our best to supply one as close as we can to the image.